Use kitchen shears to trim off any excess fat from chicken pieces. Pat dry. Drizzle oil over chicken and run in with your hands to lightly coat all the pieces. Toss chicken with the spice rub to coat all sides well. Ue your hands and get in there! Grill chicken for 3-5 minutes on each side until cooked through. While chicken is cooking, warm honey in the microwave so its not so thick. Add the vinegar and combine well. Leave a little glaze for later. Take the rest and brush on the chicken (both sides) in the final moments of grilling. Preheat oven to 400 degrees. Peel potatoes, cut into 1/2 inch pieces. On a baking sheet, toss potatoes with olive oil, season with salt. Transfer half the potatoes to a second baking sheet; cook both sheets until potatoes ar tender; tossing occasionally 25-30 minutes. Sprinkle with butter and brown sugar. Bake util sugar is caramelized and hard…about 10 minutes. 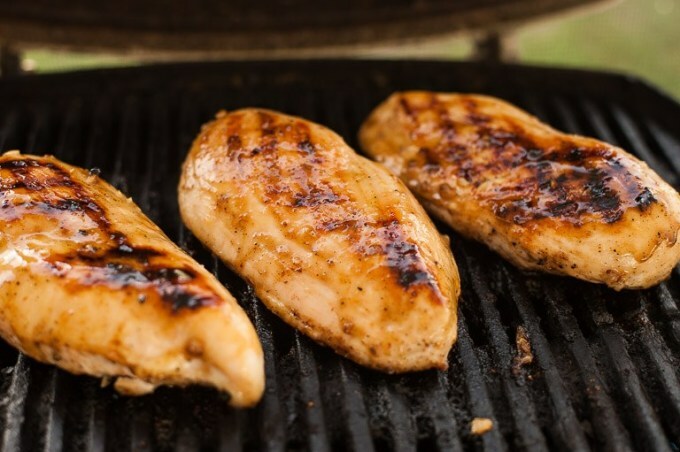 PS: Loving this honey glazed grilled chicken recipe? Click here now for the best chicken enchiladas! !